Two weeks ago, Sean Hayes had quite the health scare. 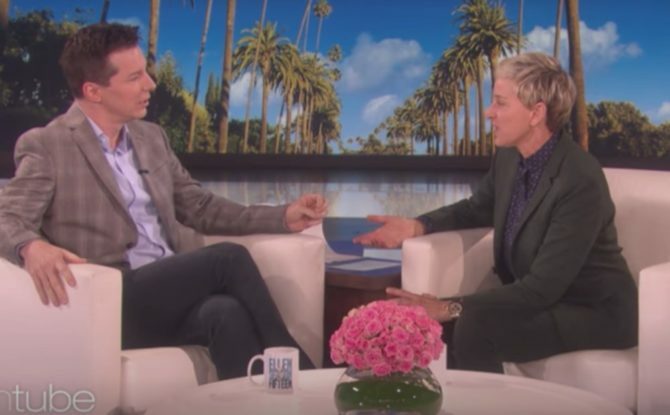 The star of the freshly reanimated Will & Grace stopped by The Ellen Show to tell DeGeneres his harrowing tale of woe: He suffered some severe pain after his small intestine burst open, sending a cascade of potentially fatal toxins into his body. The incident forced him to cancel his work commitments for several weeks while getting back on track. In fact, his appearance on Ellen had to be postponed by two weeks. After this harrowing back-and-forth, Hayes and DeGeneres leavened the mood by playing a game: Hayes brought the breathing device he’d needed to use in the hospital… and that’s where the laffs really begin. His personality is so funny now. I met him a few times back in 2001. Back then he was really shy and of coarse deep in the closet. Completely opposite of his Jack character.